Oh my word, that is SUCH a beautiful quote! I loved this quote when I saw it and with me starting a new job next month this is so appropriate, especially because I don't like big changes. It is such a simple quote, yet SO profound!! Glad you are finding inspiration to embrace your new change! It's going to be great!! Always scary tho but exciting at the same time!! 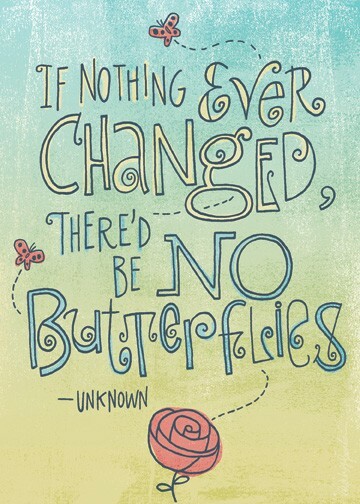 And I'm sure there will be lots of butterflies too (in your tummy) but try not to fear the change as it makes us grow just that little bit stronger! I can totally relate as I'm also not a big fan of change but when you look back, you will know that you have done the right thing!